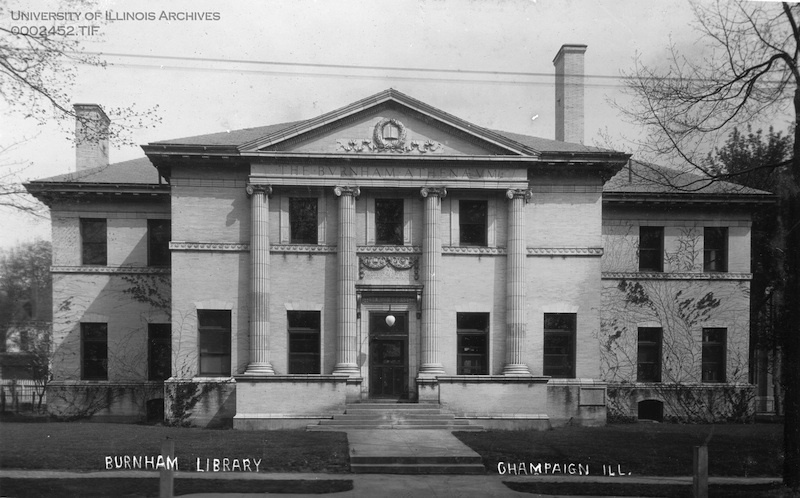 The first library in Champaign started out as a private collection. In 1868, about 300 books and periodicals were assembled in a modest reading room on the second floor at No. 7 Main Street in Champaign. Forty members of the private Champaign Library Association paid dues to use the collection. After several years of ups and downs and a move to the second floor of No. 26 Main Street, the association voted itself out of existence in 1876 and gave its assets to the city of Champaign, with a vision of creating a library open to everyone. The Champaign Public Library and Reading Room dates to July 21, 1876, when the City Council accepted the Library Association‘s gift and budgeted $1,000 a year for the library. The library moved next door to No. 24 Main Street and boasted 750 volumes. The librarian was paid $20 per month. At the time of the library's opening, anyone over the age of ten could borrow books, though only the librarian was allowed to distribute and reshelve them. After thirteen years, the library was moved to the southwest corner of the then-new City Building at the corner of University Avenue and Neil Street, where it stayed until 1896. 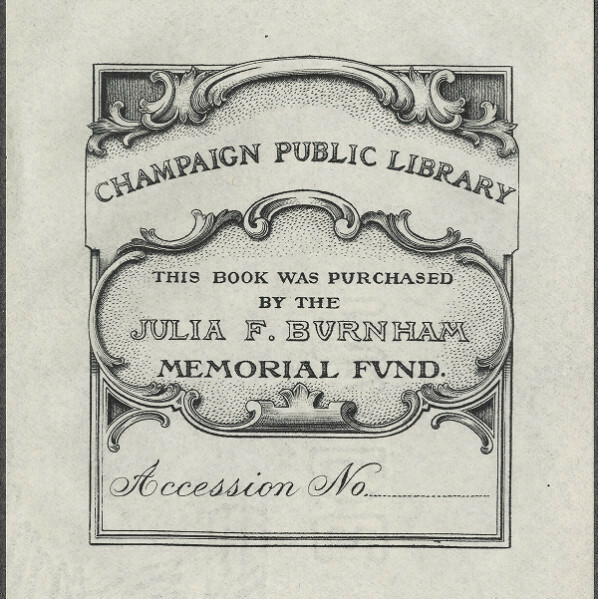 In 1894, Champaign banker and philanthropist A.C. Burnham announced a substantial gift of $50,000 for a new library as a memorial to his wife, Julia Finley Burnham, a former member of the library board. Of the total, $40,000 was for the site and building and $10,000 was for a book endowment. 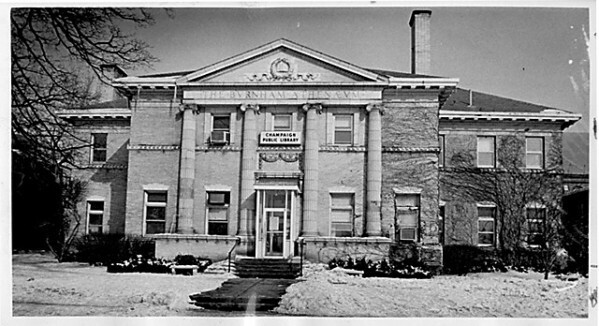 The Burnham Athenaeum at 306 W. Church St. was opened on December 17, 1896, with two librarians and 5,593 books. When it closed, the same building was bursting at the seams with forty employees and over 100,000 items. An approximately 40,000-square-foot Main Library at 505 S. Randolph St. was dedicated in November 1977. 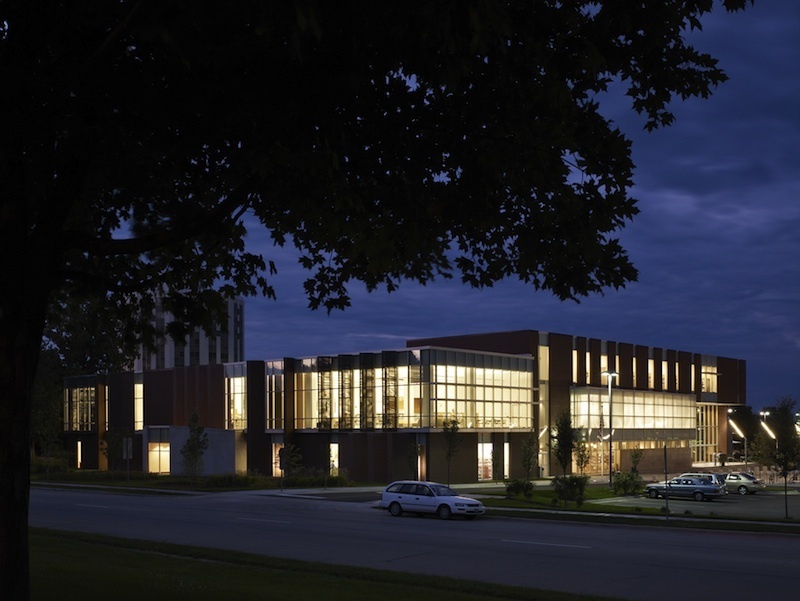 Designed by Hammond Beeby and Associates of Chicago, the building was funded largely by a $2.3 million referendum. Thirty-one years later, a new, state-of-the-art Main Library opened in January 2008 with a collection of 285,000 items and three times the space of the building it replaced. 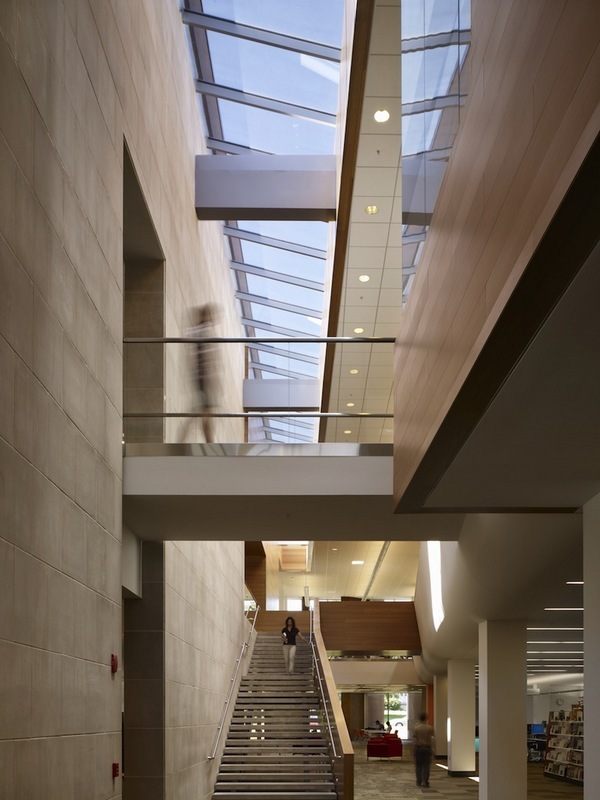 Ross Barney Architects designed the building at a cost of $22.8 million, which was funded by a combination of public and private funds. As of 2012, the library has been recognized as one of the busiest and best in the nation, lending more than 2.2 million items per year, with one of the highest per-capita checkout rates in Illinois. The library’s success has been recognized with 4-star ratings from Library Journal magazine is ranked on the national “Top 100” libraries list from Hennen’s American Public Library Ratings (“HAPLR 100"). Today’s library has two locations, a Main Library at 200 W. Green St., and the Douglass Branch Library, at 504 E. Grove St. In addition to books, DVDs, Blu-rays, CDs, audiobooks, and video games, the library offers numerous online magazines, eBooks and audiobooks to download, and pre-loaded Kindles to borrow. Its public computers and free Wi-Fi are heavily used. 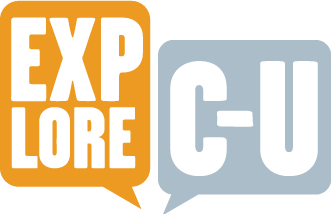 One-on-one help with computer questions and job applications is available, and librarians still answer reference questions on every imaginable topic. Free events for all ages include music performances, author talks, and film screenings. Weekly story and activity programs help build reading skills for preschoolers. A bookstore on the lower level of the Main Library sells like-new books to benefit the library. 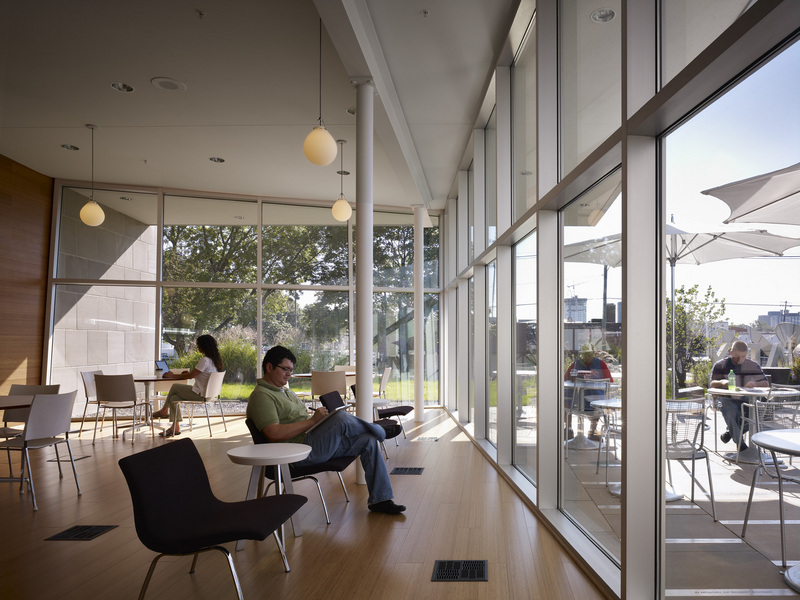 A café off the library lobby serves beverages, snacks, and light lunches, and offers catering for the adjacent Robeson Pavilion meeting rooms. 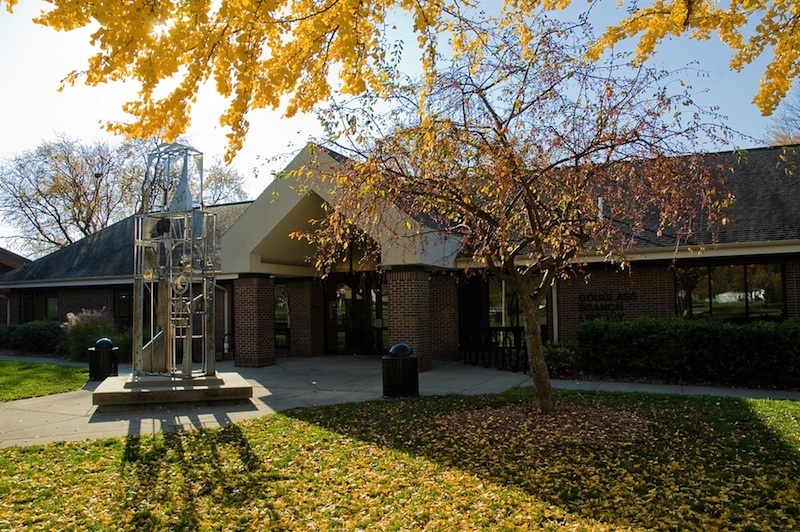 “Champaign Public Library,” ExploreCU, accessed April 21, 2019, https://explorecu.org/items/show/194.